Sew Mama Sew May Giveaway Day!! Hello and welcome to everyone stopping by for Sew Mama Sew's May Giveaway Day! I don't know about you, but I can't wait to go check out all the participants. Hopefully I'll win some loot this time. I honestly wasn't sure if I was going to be able to get something made in time but I managed to whip up 2 things to give away to one of you! 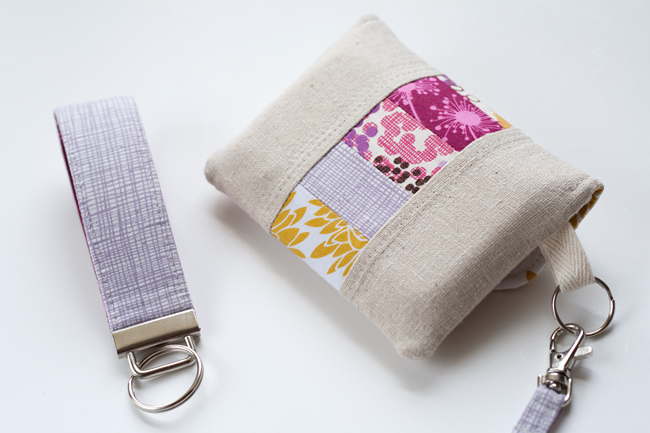 It took me a while to decide what to make and I finally decided on the wallet and key fob set you'll see below. 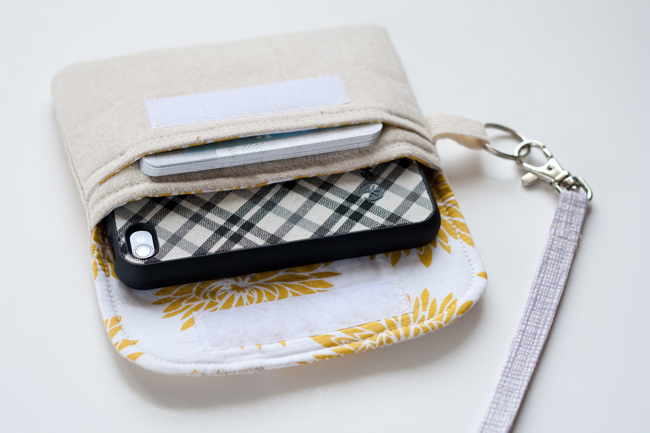 I used Keyka Lou's Basic Wallet pattern to create a fun patchwork wallet which just so happens to fit iPhones well! I added a bit of padding to the wallet along with a detachable wrist strap. There's an extra pocket for cash/cards/etc. 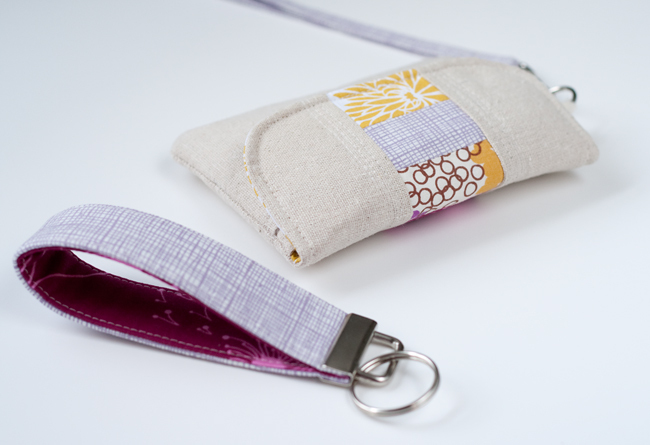 I also made a coordinating wristlet key fob because I think they're just about the most handy things ever. *Sadly, the iPhone in the photos is NOT part of the giveaway. I also won't mail you the huge stack of business cards unless you just want them! The fine print. . . Entries are now closed!! I'll announce the winner this afternoon. Thank you!!! *To enter, just leave a comment. Please, please, please leave your email address in your comment!!!! Its so nice!!! I wont it!!! Oh I just love the set you made. So cute. Lovely set. I wish I win it! I'm a follower, too. PS: my e-mail is available at my profile. What an awesome giveaway. That's pouch is so super cool and cute. Love the colors. So definitely in. merja(dot)priest(at)gmail(dot)com oh and i'm a follower too! So cute, Vanessa, thank you! What a nice prize! I love the wallet! My extra chance... I am already a follower of your blog. Handily, I have my own iphone to slip into such a cute litlte wallet. Love it! I am a follower, and forgot to leave my email it's narniamum (at) gmail (dot) com. Thanks! oh my! That's an adorable wallet! 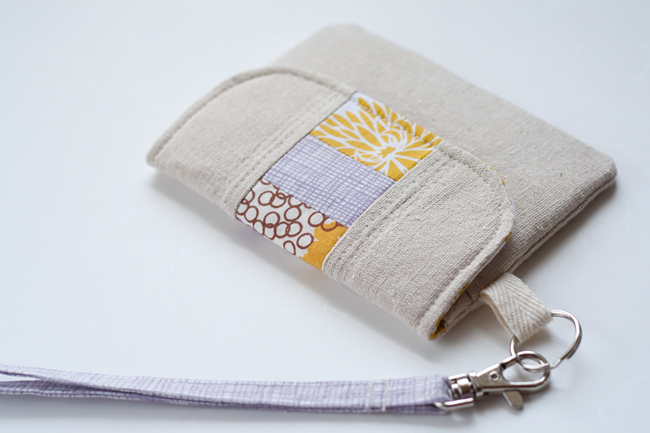 I love the patchwork on that little wallet! I'd love to have it. This is so lovely, such a great giveaway. Thanks for the chance to win. Thanks for the chance to win, this little purse is gorgeous! Oh, it's cute! Thanks for the chance to win. Lovely work as always - thanks for the chance to win. Lovely items - you do such wonderful work! I am a follower and email subscriber - and a happy one at that!! I also follow you on Reader. I absolutely love the key fob! Wow, that is really, really cute! Thanks for doing the giveaway - Love the chance to get to visit so many new-to-me blogs! That wallet looks like it would be great for protecting my phone from my kids! they are kinda hard on stuff...Very cute! Thanks! I love the wallet! So cute! I have been a follower for a while now. Thanks! Cutest little purse ever! Thanks for the lovely giveaway! 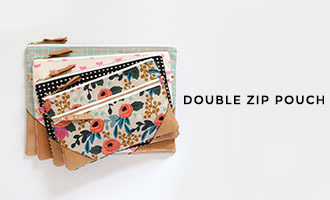 Hi, I came here through Sew Mama Sew and love this wallet. Thanks for the chance to win! Love the wallet it is beautiful! Love this set! Thanks for the opportunity! Hi , I am a follower of your blog and I love that wallet :). Thanks for the opportunity to join your give away! so beautiful! I've always loved your style. :) thanks for the beautiful giveaway! and why wouldn't I want another chance to enter ;) ?! I'm already a very happy follower! It's lovely. Thanks for giving it away! I just subscribed to your blog on my Google reader. Oh I need a new key dongle, beautiful set! Oh, this would be the perfect gift for my sister! Such a pretty little pouch! Thanks for the giveaway! this is perfect for running into the grocery store (or starbucks!) with just the essentials: iphone and credit card. gorgeous! would LOVE to have it. looks wonderful, would definitely love to win. Oh how cute. 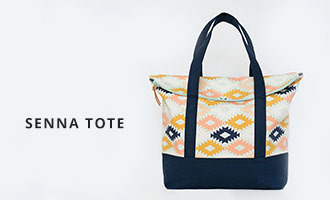 I really need a small bag like that for when I am not carrying the diaper bag. Love! I hope I win! PS: I totally have been following you since the last SMS giveaway! love this set - fabulous giveaway! I just love it! Beautiful!! I LOVE this giveaway. Good thing I happened to randomly find you on etsy and saw your profile linking your blog! casey.henshaw@hotmail.com is a new follower! That would be so perfect for trips to the park with my daughter. I usually don't have a place for my phone. I just found your blog through the giveaway but am adding you to my follow list! Super fun projects and the tutorials are really great! Oooh... I would loooove this! My iphone is just floating around in my big ole purse so this would be so nice! oh, and of course I am a follower! love your blog! My iPhone would love to live in this cute pouch. I've just realised I need a little purse about this size. It's the perfect giveaway. Love your creative sewing. You have been on my blog list for awhile and love visiting for all the inspiration. Cute wristlet! I'd love to get that! it is really cute, i´ll love to winn, and congratulation for your blog , I am a fallower. I've been a follower for a while - love your blog! Oh this is awesome! I would love to win this :) It would be perfect for my BlacBerry! Love it! I've been looking for a cute little "on the go" clutchy wallet type thing... Plus the colors are great for summer! Oh yeah, and I'm a follower!! I'm following you on flick'r and really love your work!!! This little bag is so nice. I'm also following your (lovely) blog. Such a nice job on the wallet - way cute! I love Keykalou's patterns. These are lovely Vanessa! Thanks for the chance to win. Yaaaay! I love the fabrics that you chose. Such a cute wallet. Thanks for the giveaway! Also! I have been a follower of your blog for a while, via Google Reader! What a great wallet! I haven't sewn with linen yet, but I always love to see it used in bags and wallets. Thanks for the chance to win! This is a cute giveaway! Love it!